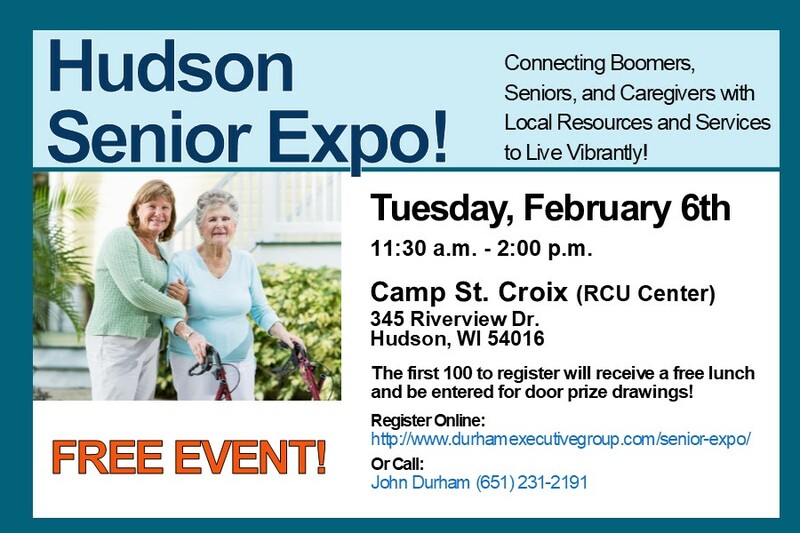 Complete the form below to complete your registration to attend Hudson Senior Expo! Enter the name, phone number and email of attendee. Please submit a separate registration for each attendee. A valid email address is required to send a confirmation of registration. If you do not have an email address, or do not wish to share it, please contact Becky Durham to register by phone (651) 231-2192. By registering for Hudson Senior Expo, you understand that your contact information will be shared with Hudson Senior Expo exhibitors and that they may contact you regarding their products/services. Photos and video may be taken for promotional purposes at Hudson Senior Expo. By submitting your registration, you are agreeing to release, defend, hold harmless and indemnify Durham Executive Group and all other Hudson Senior Expo exhibitors from any and all claims involving the use of your picture or likeness. "John was very helpful in assisting us find our new condominium. We looked from Woodbury to Bloomington to downtown MPLS to ensure we purchased that special property for us to retire in. His knowledge and... continued"